The new export brand «HUNTER». Company «AGG» SRL together with the company «ENTEH» SA and the direct participation of an experienced exporter – companies “Euro Alco” SRL – developed a new export brand «HUNTER». Extravagant appearance and quality worked out over the years, has caused considerable interest among partners, including – international. The first deliveries are planned for export on this year. Companies hope that the unusual design in conjunction with repeatedly estimate the true quality of the products, will please even the most discerning consumer. 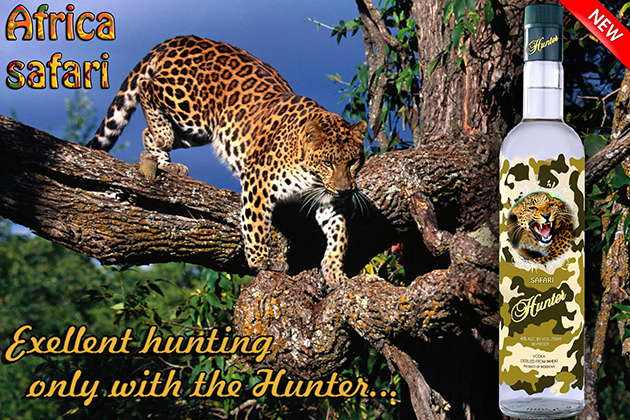 In a short period, under the new brand «HUNTER» failed to create a whole range of beverages, including: «HUNTER Platinum», «HUNTER Premium», «HUNTER Silver» and «HUNTER Safari». • under a strict quality control at all the production stages. The new brand «HUNTER» begins to fight for the conquest of foreign markets, as it has conquered all of the products under the trademark «Spicul de Aur».